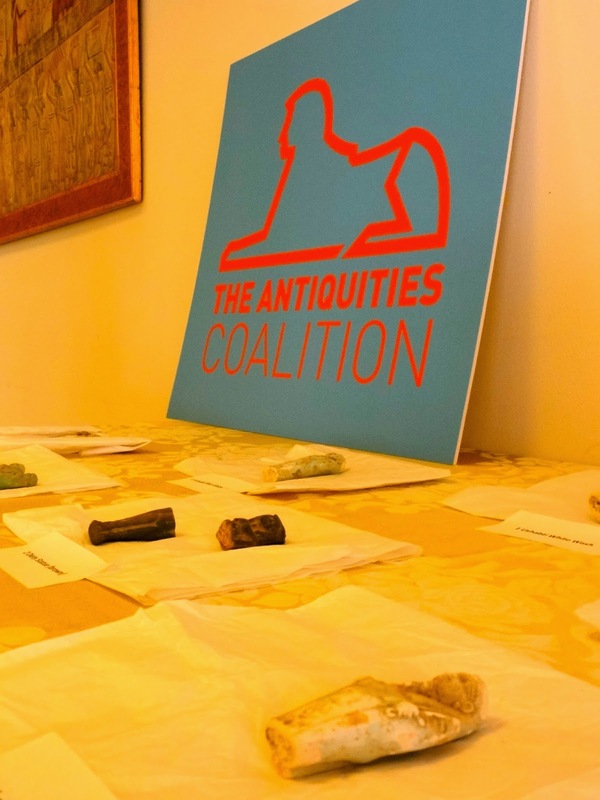 The Antiquities Coalition (AC) had the proud honor early this week on Tuesday, June 17th of repatriating a collection of 26th dynasty ushabtis to the Egyptian government on behalf of Ms. Cynthia Croasdaile, a successful writer and editor. After reading about the efforts of the Egyptian government to combat looting in a March 2014 story in the New York Times, Ms. Croasdaile was inspired to return her family’s collection of antiquities, which dates back over 3000 years. She reached out to the Antiquities Coalition to help support her efforts. Ms. Croasdaile’s connection to Egypt dates to her childhood. As a young girl, her father served as These items reminded the family of their happy years spent in Egypt. head of exploration for Phillips Petroleum in the Western desert of Egypt. At the end of his tenure, his staff presented him with this collection of ushabtis – small gods that were buried in the tomb with the deceased to serve as the servants in the afterlife. It is this connection to Egypt, however, that also inspired her to return the ancient artifacts. As the New York Times story chronicled, Egypt has been subject to mass looting – or cultural racketeering – at every major archaeological site in the country. Egyptian antiquities are now flooding global markets. Looting is up over 1000 percent at several sites. And Egyptian antiquities are now flooding Western markets. After reading about the plight of the country of her childhood, Ms. Croasdaile was moved to show her support. She called Deborah Lehr, Chairman of the Antiquities Coalition, which was mentioned in the article, to explore how best to repatriate her family’s collection to Egypt. Ms. Lehr, on her behalf, presented to antiquities to Egyptian Ambassador Mohammed Tawfik on June 16 at the Egyptian Embassy in Washington, DC. Mr. Croasdaile’s collection of ushabtis will be returned to their homeland where they will be part of a growing exhibition of repatriated Egyptian antiquities. The Ambassador noted the importance of actions such as Ms. Croasdaile to the overall effort to fight against looting. The AC was also delighted to have Ed Liebow, President of the American Anthropological Association (AAA), Dr. Brian Daniels, Director of Research and Programs, Penn Cultural Heritage Center as well as several of our esteemed members from The Antiquities Coalition including Mary Ellen Lane, Executive Director of the Council of American Overseas Research Center (CAORC); and Dr. Alexander Nagel, Smithsonian attending the ceremony.